I have a MetaTrader 4 account. Can I get another one? Yes. If you have an existing MetaTrader 4 account, you may request another one by following this link and filling out the electronic form. I need to reset my password. How do I do that? Why did my order get filled at a different price? When you use MetaTrader 4, your orders will be filled at the nearest market price, this is known as slippage. This can be at a worse or better price than you requested. Slippage is possible on all orders during times such as when the market reopens, around news announcements, and at times of extreme market volatility. Trades made on MetaTrader 4 will be filled completely or not filled at all. How will I know if I’m close to a margin call? When your free margin falls below 100% of your margin requirement our system will automatically send a warning email. If your free margin falls below the 100% margin level required please be aware that your trades may begin to be liquidated. If any position is liquidated you will receive an email informing you of this. Please note that in fast markets there may be little or no elapsed time between the warning being sent and the position liquidated. You should always be aware of your risk and your margin requirements and ensure you have sufficient funds in your account to cover those requirements. What’s the lot size of my trade? For CFD accounts in MetaTrader 4, 1.0 equals 100,000 units, .10 equals 10,000 units, and .01 is equal to 1,000 units. You can enter a specific lot size when you place an order in the New Order window, the Mini Terminal, or the Trade Terminal. You can also view the lot size of your current positions in the Open and Pending Orders section of the Trade Terminal and on the Trade tab of the Terminal window. You can use trailing stop orders to help protect profits without limiting any potential gains on your open positions. When you enter a trailing stop on an open position, you select a specified number of pips or points (10 points = 1 pip) between the stop and the current price. MetaTrader 4 will then place the trailing stop in two parts. The market must first move in your favour by the number of points that you set and then it will place a stop loss order. That stop loss order will then automatically update as long as the market moves your way so that it ‘trails’ the current price by the number of points you set. When the market moves against your position after the trailing stop loss has been set, the stop loss remains set at the last trailing price that it reached when the market was moving in your favour. You can confirm this price by looking at the S/L column within the Trade tab or the Open and Pending Orders window. How does a trailing stop work in MetaTrader 4? Let’s look at an example. We’ll say that you are long EUR/USD at 1.3500. You want to protect what you’ve earned so far; so you enter a 200 point (20 pip) trailing stop order. Once the market hits 1.35200, the trailing stop becomes active in MetaTrader 4. At 1.35200, the stop will trail the current price as long as the market moves your way and you are still logged in. However, you need to log out of MetaTrader. The market is at 1.35300. Even though market moves your trailing stop will no longer trail but becomes a regular stop loss order at 1.35100, 200 points below the last market price. Now, let’s say that you log back in. While you were logged out, the EUR/USD didn’t move below 1.35100 (so your stop loss was never triggered). In fact, the EUR/US D rose steadily to 1.36000. In this case, MetaTrader will adjust the stop loss to 1.35800 and resume trailing the current market moves by 200 points. However, if the market had moved to 1.36000 and then subsequently fallen back to 1.35000 your stop would have been activated at 1.35100. How do I place a trailing stop on an order? There are several ways to place a trailing stop in MetaTrader. You can place one quickly by right-clicking in an order row on the Trade tab of the Terminal window and select Trailing Stop. This displays a drop-down menu where you can select the number of points (10 points = 1 pip) you want. 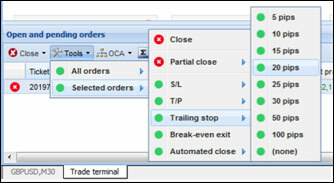 In the Open and Pending Orders section of the Trade Terminal, you can place trailing stops on all positions or selected ones by clicking Tools and under both the All Orders and Selected Orders options, you can choose Trailing Stop. From this list, you can select a trail in pips. 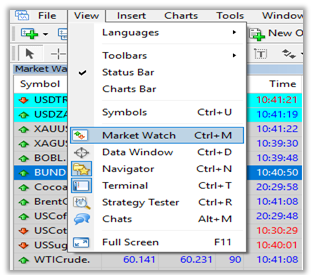 From the Mini Terminal or the Market Watch section of the Trade Terminal, you can click the Edit icon and select New Order. When the New Order window opens, you can set up the order and specify a trailing stop. Once active, you can look at the S/L column within the Trade tab or the Open and Pending Orders window. Does my trailing stop work if I log out of my MT4 account. No if you log out of your MT4 account your trailing stop will become a hard stop. See ‘How does a trailing stop work in MetaTrader 4’ above for further details. Please note if you use our VPS service your MT4 account is always logged on. If an extreme world event happens over the weekend, there may be a significant difference in the price of a market when it closed on Friday and when it will open on Sunday. This is called gapping and it means that there are no tradable prices between the closing price on Friday and the opening price on Sunday. All orders which are triggered by the jump in price will be filled at the opening rate at the beginning of the week. The Asian trading session starts around 7PM Eastern Time and ends around 4AM Eastern Time. When is the US trading session for Forex trading? The US trading session starts around 7AM Eastern Time and ends around 4PM Eastern Time. When can I place trades in MetaTrader 4? You can place orders and monitor your positions on MetaTrader 4 from 17:00 ET on Sunday (22:00 UK Time) until 16:45 ET on Friday (21:45 UK Time). If there is a change to these hours due to a holiday, we will send out an advanced notice. Can I hedge trades using MetaTrader 4? Yes you can have both a long and short position in the same currency pair with an equal number of lots. You will be able to see both positions on your MetaTrader 4 account. How do I access MT4 on my iPhone/iPad? Search for MT4 or MetaTrader. Download the free app called Metatrader 4 by MetaQuotes Software. Open the app and choose one of the login options. Enter your ForexCFDs MT4 login and password. How do I access MT4 on my Android device? How do I close an open position on the MT4 mobile app? To close an open position, you need to tap the position in question, revealing the full details of the position. Press and hold down on the details section in order to access the menu to close. Can I attach a stop or take profit order to an existing order or position on the MT4 mobile app? You can attach a stop, or take profit to an existing order in the app. To attach a stop or take profit order to your existing position press and hold down on the order and choose the modify option. Are EAs available on MT4 Mobile? No, EAs are currently not available on the mobile apps. First, obtain your MetaQuotes mobile app ID in the MetaTrader 4 iPhone or Android apps by going to Settings > Messages. The first message labelled “Hi” contains your MetaQuotes ID. Next, in the MetaTrader 4 desktop terminal, go to Tools > Options > Notifications, enter your MetaQuotes ID, check off “Enable Push Notifications,” and click OK. Then, click on the Alerts tab and right click to pull up the options menu. To create a new alert, click Create, enter your specifications, and choose Notification as your delivery method within the Actions section. You will receive your rate alert as a push notification to your mobile device. MetaTrader 4 (MT4) is an electronic trading platform with automated trading capabilities. We have licensed the software so our clients can access ForexCFDs liquidity while using MT4. Will I be able to download the software on my Macintosh computer? The MT4 software will only be available natively for Windows based applications. But some third party software on the Macintosh such as Parallels, WinOnx, etc. allow you to run windows based software on them. We have a guide to doing this. Where can I download the MetaTrader 4 software? You will need an account to access all of the features of the MetaTrader 4 platform. To sign up for an account, Click here. How do I register for a demo account? You can register for a ForexCFDs MT4 demo account quickly and easily via our website: Click here. Applying for a ForexCFDs MT4 account is quick and easy. The online application takes less than 5 minutes to complete and can be accessed at the following link: Click here. What lot sizes are available? 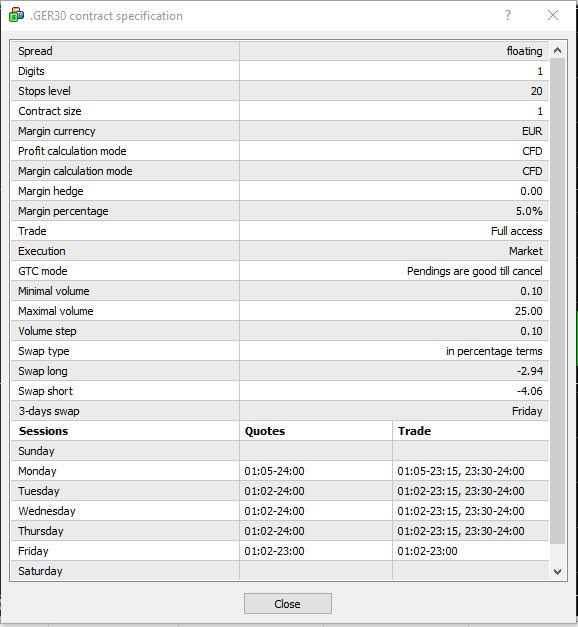 MetaTrader 4 users have the option to trade in micro (.01), mini (0.1) and standard lots (1.0). I’m receiving a message saying: “Trade context is busy”. What should I do? To resolve the error message Trade Context is Busy, log out and log in to the ForexCFDs MetaTrader 4 platform. This message appears if the cancel button is pressed while an order is in the process of execution. Will fractional pips be offered on MT4? Will hedging be automatically enabled? Is one-click trading feature available on MT4? Will MT4 allow for partial fills on large orders? No. Orders to open and close trades, as well as take profit (TP) orders execute Fill or Kill (FOK). These orders only execute if they can fill in their entirety at the requested price. These orders cannot be broken up and filled at multiple prices. Will there be order size limits on MT4? ForexCFDs MetaTrader 4 allows for order sizes up to 50 million per trade for the Pro account tier. Please check our market information sheets for further information. Can I have two accounts show in the MT4 client terminal? Only one account will show at a time in the MT4 Client Terminal. You receive daily and monthly statements by email. Additionally you can download your trade history reports from the MT4 trade terminal directly. Where can I obtain my account reports? The dealing software tracks all trading activity in real time, allowing clients to view current open positions, real-time profit and loss, margin availability, account balances and all historical transaction details directly on-screen. In addition, clients can access their account statements by right-clicking in the Account History tab and selecting their time frame. What ports do I need to have opened to run MetaTrader 4? You will need to open port 443 on your firewall to properly run the MetaTrader 4 platform. How do I see all the currency pairs that ForexCFDs offers? Within the Market Watch window, all of the currency pairs eligible to trade can be viewed by right-clicking within this section and selecting ‘Show All’. All currency pairs will appear thereafter. Click on the symbol you want to view from the Market Watch section of the trading platform and drag it into the chart window. To change your language preference, go to View > Languages. Select your default language. You may need to restart the MetaTrader 4 application for the changes to take effect. How do I zoom in or out of a chart? To zoom in or out on a chart, right-click on the chart and select Zoom In or Zoom Out. You can also use the keyboard shortcut (Shift +) to Zoom in and (Shift -) to Zoom out. How do I change my chart type? From the top Menu bar, select Charts. Choose your chart type preference. With MetaTrader 4, you can use automated trading strategies called expert advisors (EA) to perform prompt technical analysis of price data and manage trading activities based on current market conditions. If you are using an EA and do not have a Virtual Private Server subscription, your EAs will stop running when you are logged out of Meta Trader. If you have questions on how an EA works, you will need to contact the EA provider. But, if you need help managing EAs in MetaTrader 4, our client services department will be happy to help you. What do I need to program Expert Advisors and custom indicators? Will I be able to upload my Expert Advisor? A custom indicator is a program developed in MetaQuotes Language 4 (MQL 4) by the user and functions as a technical analysis trading indicator. Technical indicators are mathematical calculations of currency pair prices created to help forecast future price changes. Traders use indicators to help assess if a current trend will remain the same, and where it will turn. Indicators are intended to simplify the complicated process of decision making in trading. Their algorithms are also used to develop trading tactics and Expert Advisors. To add a trend line or line study, go to Insert > Lines and choose a line study. Line studies can be adjusted on the chart by dragging the white point to the desired area. How do I view the time frame toolbar? What time zone is used for charts and can I change it? Charts are based off server time and cannot be changed. To place a trade, select Tools > New Order. Choose the currency pair’s symbol, the trade size volume, and Market Execution for Type. Click Sell or Buy within the Market Execution section to place the trade. To close an open position, double-click the position within the Trade section of the platform. Within the Order ticket, click the Close button. You will receive a confirmation of your trade. To save the settings to default so that whenever a new chart is opened the settings are automatically applied (once the chart is modified) go to the “Template” button (usually the last button on the right of the toolbar), click “Save Template” and give your template the name “Default.”. Can I receive alerts via Email? (All SMTP settings vary depending on your Internet Service Provider. If this error message is received, contact your ISP’s technical support and ask for the SMTP settings. If you use Outlook, you can find out the SMTP settings by going to Tools > Email Accounts > Next > Change (> Cancel when done)). Select to TOOLS > OPTIONS. Edit these settings according to your ISP’s requirements. Typically the light red text is a general guideline of should be entered. For clarification, call your ISP. (Note: web based email services such as Hotmail, Yahoo, Gmail and others will not work). SMTP Server – This is your ISP’s mail server address. SMTP Login – This is your login ID to access your mail. SMTP Pass – Your mail password. From – This is the email address the email will come from. This is typically the same address as stated in the SMTP login field. To – The address you want it to go to. Before you click on the “TEST” button be sure to select “OK” to apply the settings, then go back into TOOLS > OPTIONS to test your settings. See the JOURNAL (Terminal window > Journal) for any error messages. The email settings in the tools menu can be combined with an Expert Advisor or Alert that triggers an email sent to you. We do not offer support for this. Navigate to the ALERTS tab in the TERMINAL window. Right-click anywhere in this window, and select “CREATE”. To the far right of the “SOURCE” field is a button with 3 dots, “…”. Click this button to edit the specifics to your email (i.e. subject and body). Note, to send an email to your cell phone keep in mind that some cell phones are limited to 160 characters per message, including the subject line. Timeout means once the criteria is met it will wait X seconds before generating another signal. Max Iterations means it will generate a signal X amount of times before stopping. Thus at default settings, if you do not edit this you will get an email every 10 seconds for the next three hours. Drawdown is the difference between the balance of your account, and net balance of your account. The net balance takes into account open trades that are currency in profit, or currently in loss. If your account net balance is lower than your account balance, this is called drawdown. An interest rate differential is the difference in interest rate between two currencies in a pair. If one currency has an interest rate of 3% and the other has an interest rate of 1%, it has a 2% interest rate differential. A take profit order is an order that closes your trade once it reaches a certain level of profit. When your take profit order is hit on a trade, the trade is closed at the current market value. Take profit orders are also sometimes referred to as limit orders. A stop loss is an order that closes out your existing trade in order to limit losses. Stop losses are literally used to stop the loss of your trading capital. When your stop loss order is hit on a trade, the trade is closed at the current market value. What does it mean to “go long”? When you go long you are simply placing a buy order on a currency pair. A Pending order is an instruction to open a position when the current price reaches the order level. The spread is the amount of pips between the bidding price and the asking price. The spread is what Forex brokers use to make money on every Forex trade placed through their network. For example, the Forex broker may be paying a price of 1.3600 for buying or selling. The broker will then allow you to buy the currency for 1.3601 or sell it for 1.3599. The spread always stays around the actual price that the Forex broker is paying. So when you buy, you get one end of the spread and when you sell you get the other end of it, and vice versa. By the time you close your trade, you will have always paid the spread. Market noise is the seemingly mindless back and forth movement on the smaller time frames. A trader’s definition of market noise is usually relative to the time frames that they are trading. A trader that trades a 1 hour time frame might think that the 15 min chart contains market noise while a trader that trades 15 minute charts might think that a 5 minute chart contains market noise. A margin call happens when a trading account no longer has enough money to support the open trades. This happens when there are too many floating losses. For example, if you are using 200:1 leverage and you have a $20 account and use $10 to open a trade; your trade size on the market would be $2000. Each pip would be worth around 20 cents. If the market moved against you by 50 pips that would be floating loss of $10. Since it takes $10 to keep your trade open, at a floating loss of $10.01, you will no longer have enough free margins to cover your required margin. At that point we will automatically send you an email warning you your margin is less than 100% and you need to add funds to your account. The amount of margin is dependent on the leverage on your account; if your leverage is 1:200 you will be required to pay 0.5% margin; if your leverage is 1:50 your margin requirement is 2%. No. of contracts x contract size x price x margin percentage. Balance: When you have no open position, balance is the amount of the money you have in your account. For example, when you have a $5000 account and you have no open position, your account balance is $5000. Equity: Equity is your account balance plus the floating profit/loss of your open positions: Equity = Balance + Floating Profit/Loss. When you have no open position, and so no floating profit/loss, then your account equity and balance are the same. And for example when you have some open positions and they are $1,500 in profit in total, then your account equity is your account balance plus $1,500. If your positions were $1,500 in loss, then your account equity would be your account balance minus $1,500. PIP stands for Percentage In Point. It is equal to 1/100 of 1%, or .0001. In Forex, currency prices are typically quoted to the fourth decimal. For example, if the EUR/USD pair moves from 1.3410 to 1.3420 it has moved by 10 pips. If the EUR/USD increases by 1 full cent in value (from 1.3410 to 1.3510), it has increased by 100 pips. The monetary value of each pip depends on three factors: the currency pair being traded, the size of the trade, and the exchange rate. Based on these factors, the fluctuation of even a single pip can have a significant impact on the value of the open position. In Forex trading, all currencies are quotes in pairs. For example, in comparing the Euro Dollar (EUR) to the US Dollar (USD), you would quote the currency pair EUR/USD. A currency pair is a set of currencies that are being quoted against each other. In a currency pair there is always a quote currency and a base currency. The first currency in the pair is the base currency and the second currency is the quote currency. When we render a Forex quote for this pair, we are saying how many dollars each Euro is worth. If the quote is EUR/USD 1.31 that says 1 Euro is worth 1.31 US Dollars. How do I calculate CFD FX and Non-FX statement conversion rates? The profit of CFD trades is initially calculated in the quote currency of the symbol and then converted into the base currency of your trading account. The conversion rate used for the calculation is the current market rate. To calculate the conversion rate that has been used to calculate your profit you first need to calculate the profit generated in the quote currency. FX symbols are composed of a Base Currency and a Quote Currency. The notional value of the Base currency is calculated as the contract size (100,000) x the lot size. The differential of the quote currency’s value is the profit or loss that has been generated on the trade. For example, you execute the below EURGBP trade and you wish to calculate the conversion rate used to generate your Profit & Loss in AUD (P&L in AUD) on your statement. Above calculation shows that you have bought 0.10 lot EURGBP at 0.88824 (10,000 EUR at 0.88824) and then sold 0.10 lot EURGBP at 0.88854 (10,000 EUR at 0.88854). In the market terms it means that to buy 10,000 EUR when EURGBP is trading at 0.88824 one would need to sell 8,882.40 GBP. To sell back 10,000 EUR later when market is trading higher at 0.88854 one would have made profit of 8,885.40 – 8,882.40 = 3.00 GBP. To calculate conversion rate for above example you would need to divide P&L in the quote currency (GBP) by the P&L in the account currency (USD) that can be found in your trading terminal and/or on your account statement. In this instance the conversion rate of 0.56818 would represent the AUDGBP conversion rate. Non-FX CFD products are quoted in the base currency of the symbol. This is (usually) the currency of the country or region where the product is based e.g. SP500 in USD and Bund in EUR. Contract Sizes and tick values need to be taken into account for calculating the notional value of the symbol. For example, you execute the below GER30 trade and you wish to calculate the conversion rate used to generate the Profit&Loss in USD on your statement. The GER30 is valued in base currency EUR, and has contract size of 1 and the tick value of 1. Above calculation shows that you have bought 0.20 lot GER30 at 13,190.50 (2,638.10 EUR) and then sold 0.20 lot GER30 at 13,074.50 (2,614.90 EUR). In the market terms it means that to buy 0.20 lot GER30 when GER30 is trading at 13,190.50 one would need to sell 2,638.10 EUR. To sell back 0.20 lot GER30 later when market is trading lower at 13,074.50 one would have made loss of 2,614.90 – 2,638.10 = -23.20 EUR. To calculate conversion rate for above example you would need to divide P&L in the quote currency (EUR) by the P&L in the account currency (GBP) that can be found in your trading terminal or on your account statement. In this instance the conversion rate of 0.64570 would represent the AUDEUR conversion rate. All specifications for each symbol (including contract size) can be found on our MT4 platform. As can be seen below all details of symbol selected are included on specification table. A technical indicator is a graphic representation of price action. Some technical indicators overlay on the trading chart, and some reside on the bottom of the chart. Typically a technical indicator is just some type of oscillation of the price based on parameters that you set. Leverage is the ratio of a margin amount to the borrowed amount. These ratios are commonly quoted as follows: 1:25, 1:50, 1:100, 1:200. For example, 1:50 leverage means that, to open a trade, you should have 50 times less amount than the amount of a trade. ForexCFDs offers leverage from 1:1 to 1:200. You can request to change your leverage by sending an email to clientservices@.forexcfds.com.au with the following information: trading account number and the leverage you want to request. I cannot log in to the platform. What should I do? Contact our client services department clientservices@forexcfds.com.au or by phone on +61 (0)2860 78840. Please have your trading account number ready. What can I do if I have a trade query?